Offering a premium feel, the Conti Super Soft Large 100 Pack is noted as the premium product for patient cleansing. Developed by a leading brand in this field, these soft and durable wipes can be used alongside water or dry to remove even the most durable of soiled materials. Presented in protective packaging with a perforated slit down the center for easy access, these C-fold wipes have been specially packed to ensure each one can be removed individually and using just one-hand to avoid cross contamination. 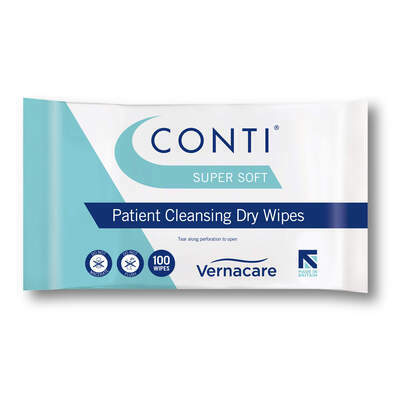 Used by NHS professionals for over 30 years and proven to be the best available to date, stock up on these large-size Conti super soft wipes today and ensure your patients receive the best care. Take a browse through the other Conti Wipes we have in stock or choose an alternative in our Oasis Bed Bath Unperfumed Wet Wipes 10.